It is a competitive world out there, and additive manufacturing (AM) OEMs face pressures like all manufacturers do when it comes to differentiating their products from their competitors. Why will an end-user choose your machine over that of another supplier? While it may come down to features and ease of use, often, the overriding criteria is how complete of a solution you can offer. In the AM world, completeness comes down to a question of how tightly coupled the software solution is to the hardware, and how much of the process or workflow it can handle. While all of these approaches are valid, there are pitfalls to each. In all cases, partnering with Spatial -- the leading vendor of 3D modeling software development toolkits -- will give you access to robust solutions tested by millions of end users over the past 30 years, plus access to higher revenues and greater end customer satisfaction. This blog explores each of these scenarios and explores how Spatial SDKs play an important role in the solution. Some AM OEMs focus on building the best machine they can, hoping to carve out a niche. They believe that the end-user will pair the best machine on the market (theirs) with the software that best meets the user’s needs. While this sounds like a good strategy, an issue arises when the end-user (or even prospect) has selected a software solution that does not take advantage of the key features of your machine. Or worse, it takes advantages of your competitors’ features. The risk of relying on the market to solve the problem is that the available software solutions may not be to your advantage. Differentiation is key to success in the marketplace. Moreover, a hardware-only product without software to bolster the differentiation ultimately results in lower hardware sales revenue. The solution then is to develop your own software front-end, which implies developing a 3D modeling kernel. While developing a custom modeling kernel provides the ultimate control, it does carry large development costs along with ongoing support costs. Moreover, companies may not have access to the required 3D modeling expertise in-house and may face challenges in trying to hire fast enough to keep up in today’s competitive market. Need Additional Insights on How to Improve Your Additive Manufacturing Offerings? But why reinvent the wheel when you can partner with Spatial and gain access to an industry-leading modeling kernel and world-class interoperability? Spatial modeling technologies power some of the most advanced 3D applications in the industry today. Based on the continuous advancement of capabilities provided by Spatial, our partners stay ahead of their competition by focusing their software development on unique features instead of standard-fare, common features. Using Spatial SDKs will allow your new development team to focus on your value-add and leveraging your offering’s unique capabilities while knowing you can deliver a best-in-class software solution. Our partners can command market premiums by demonstrating increased end-user efficiency and better results. In this scenario, an AM OEM refers end-users to a (possibly trusted) third-party independent software vendor (ISV). This scenario, while an improvement over letting the end-user select whatever software they desire, has two major drawbacks: The ISV operates according to its own set of priorities and marketing goals. For example, while it may be willing to support a new differentiating feature in your machine, you cannot control when the feature will be released, resulting in delayed availability of software to support new machine features. The risk that a new software feature needed to support a special capability for your machine may enable a similar capability in a competitor’s machine. Of course, in this scenario, all the software revenue goes to the ISV. While the prospects of starting your own software development are daunting, it does provide true differentiation by offering unique functionality, fully accessing all the capabilities of your equipment. However, it adds to management and development costs. Leveraging the offering of a toolkit, the vendor can remove risk from the schedule as well as allowing your software team to focus on the user interface and connectivity to the tool — areas that can benefit greatly from their expertise. Need Insights on How Your Software Can Support 3D Manufacturers? As a vendor of software development toolkits, Spatial delivers robust solutions tested on thousands of datasets from hundreds of OEMs and ISVs. Taking advantage of Spatial’s offering can help your team come up to speed quickly. Your solution benefits from Spatial engineering team’s years of experience in dealing with CAD data from the widest variety of sources. As a result, from a support perspective, your team does not have to deal with the usual maturation issues that come with rolling out all-new code to customers. Moreover, due to the maturity and robustness of the solution, the amount of support issues over the life of the release is greatly reduced. Your customers benefit from all code improvements were driven by the larger Spatial community. In a white-label or private-label software solution, an AM OEM partners with a software vendor to resell their software solution under their branding, possibly with some customization. While a white-label/private-label software solution might appear to be a quick solution to the drawbacks inherent of referring end customers to trusted third-party ISVs, it is not a cure-all, despite the additional revenue it may bring in. A white-label solution does provide leverage for the AM OEM to obtain some customization specific to the needs of their customer base. The ISV operates according to its own set of priorities and marketing goals. The risk that a new software feature will eventually be available to a competitor offering. The ultimate issue with a white-label solution is that it does not make an AM OEM the master of its own destiny. It is still reliant on the cooperation of a third party who has their own agenda and marketing concerns. 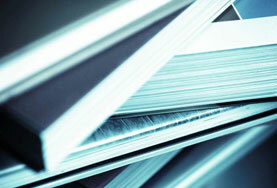 Not to be overlooked is the low gross margin available for selling a white-label application. Deciding to develop a solution in-house, brings up the question of make versus buy. Setting up a development effort from the ground up can be expensive, not to mention the schedule to first software delivery. 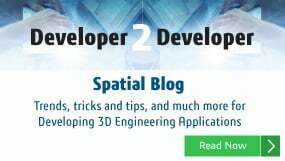 Spatial can help by delivering off-the-shelf software components, proven by the market that serves as the core for the solution, plus professional development services that are specifically experienced in 3D application development. Reduced staffing requirements: The new engineering team can focus on customization rather than on developing a modeling kernel and translation routines. Shorten development time: Because the solution is built using Spatial components, development time only needs to encompass application customizations. More robust solution: The end application benefits from Spatial’s experience as the foundation of hundreds of 3D CAD applications. Gone are the worries about the issues that come with an immature solution. A viable approach for an AM OEM is to build a custom application that meets their needs through customizations to a third-party end-user application. This approach gets an OEM closer to achieving a custom solution for less development cost than for a full custom approach. While this approach is a step up from a white-label offering, it only provides for customization around the edges of an existing application. Suffers from providing low software margins. The platform vendor reaps the majority of the software revenue. Has limited flexibility to create differentiating software or an outstanding end-user experience due to the low number of APIs available for the OEM’s customization. May be hampered by lack of access to world-class software routines. Quality of results is key in 3D modeling. Lack of solution robustness due to the limited user base, leading to higher support costs. Higher software margins due to the lower licensing costs of Spatial SDKs. The ability to focus on your value-add by leaving the heavy lifting of 3D data translation, 3D modeling, and visualization to the experts at Spatial. More robust solution due to the large Spatial user base and experience. Shortened time to market due to the reduced development effort. Developing a custom software solution from the ground up does provide the ultimate control. An AM OEM can define all of the requirements, tailoring the software solution to take full advantage of the hardware solution. Cost and difficulty associated with hiring and retaining a large and capable development team. The experience and competency of the development team can outweigh all of the other variables affecting the development and deployment of 3D applications. Protracted development cycles due to the top-to-bottom scope of a custom solution. Reduced (or no) interoperability due to the amount of effort required to develop, test and maintain translators to/from third-party formats. Restricted capabilities due to the limitations of a custom modeling kernel. Increased support costs when rolling out a new application due to the limited user base (more users lead to a more robust solution). Leveraging Spatial toolkits in your solution can remove risk from the schedule, as well as allow your software team to focus on your value-add: the user experience and connectivity to hardware. You gain access to a world-class 3D modeling kernel and high-quality translation capabilities, allowing you to deliver a robust solution with guaranteed best-in-class interoperability. By partnering with Spatial, development teams gain access to over 30 years of 3D modeling experience and people who can provide invaluable insight into solving your toughest modeling issues. Spatial can help you gain control of your destiny by enabling you to deliver best in-class software solutions that showcase the best capabilities of your hardware. By pairing your hardware with a world-class software solution built on an industry-standard modeling kernel, you are better able to compete and profit in today’s tough markets.